Our Chicken Dumpling is OUT OF STOCK, but we have ordered more! You are still able to purchase it now and we will ship it to you as soon as it arrives. Questions? Please call 1-800-438-5346 or email us at info@Lehmans.com. Our Chicken Broccoli is OUT OF STOCK, but we have ordered more! You are still able to purchase it now and we will ship it to you as soon as it arrives. Questions? Please call 1-800-438-5346 or email us at info@Lehmans.com. Our Chill-Chasin' Chili is OUT OF STOCK, but we have ordered more! You are still able to purchase it now and we will ship it to you as soon as it arrives. Questions? Please call 1-800-438-5346 or email us at info@Lehmans.com. Our Hungarian Mushroom is OUT OF STOCK, but we have ordered more! You are still able to purchase it now and we will ship it to you as soon as it arrives. Questions? Please call 1-800-438-5346 or email us at info@Lehmans.com. Our Roasted Garlic Potato is OUT OF STOCK, but we have ordered more! You are still able to purchase it now and we will ship it to you as soon as it arrives. Questions? Please call 1-800-438-5346 or email us at info@Lehmans.com. Our Tavernhouse Cheese is OUT OF STOCK, but we have ordered more! You are still able to purchase it now and we will ship it to you as soon as it arrives. Questions? Please call 1-800-438-5346 or email us at info@Lehmans.com. Good enough for company! Easy-to-prepare, dry soup mixes taste like you spent all day in the kitchen. Just add water and simmer 30-45 minutes. Simple as that. Spend more time with your guests, less time in the kitchen. Dry soup mixes are an easy fix for dinner, but more importantly, they taste delicious. 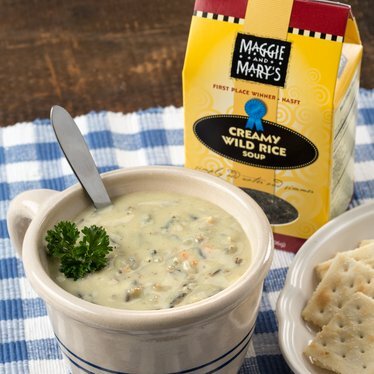 Maggie and Mary's soup, Creamy Wild Rice, has even won first place at the International Fancy Food Show. Be Well Chicken: Dumplings (durham wheat, eggs, water), maltodextrin, dehydrated chicken, modified corn starch, dehydrated vegetables (carrots, onion, parsley), chicken fat, salt, dextrose, hydrolyzed corn gluten, sugar, disodium inosinate and guanylate, torula yeast, soy flour, autolyzed yeast extract, silicon dioxide (to prevent caking), spices, natural flavors soy sauce (soybeans, wheat, salt), and turmeric (added for color). Chicken Broccoli: Modified corn starch, nonfat milk, dehydrated chicken meat, canola oil, corn syrup solids, salt, chicken fat, hydrolyzed corn gluten, sugar, dehydrated onion, disodium inosinate and disodium guanylate, dipotassium and disodium phosphate, dextrose, sodium caseinate, torula yeast and autolyzed yeast extract, soy flour, xanthan gum, mono and diglycerides, natural flavor (contains wheat), turmeric extract (added for color), parsley, spices, and dehydrated garlic. Broccoli: broccoli, sucrose. Chicken Dumpling: Dumplings (durham wheat, eggs, water), maltodextrin, dehydrated chicken, modified corn starch, dehydrated vegetables (carrots, onion, parsley), chicken fat, salt, dextrose, hydrolyzed corn gluten, sugar, disodium inosinate and guanylate, torula yeast, soy flour, autolyzed yeast extract, silicon dioxide (to prevent caking), spices, natural flavors, soy sauces (soybeans, wheat, salt), and turmeric (added for color). Chill-Chasin' Chili: Dried red beans, dried vegetables (tomatoes, onions, green chilies, green bell pepper, garlic), modified corn starch, salt, spices, extractives of paprika (added for color), soybean oil, sugar, xanthan gum, citric acid, and disodium inosinate and disodium guanylate. 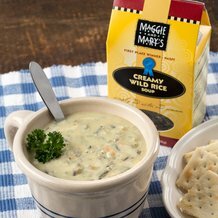 Creamy Wild Rice: Modified corn starch, nonfat milk, dehydrated chicken meat, canola oil, corn syrup solids, salt, chicken fat, hydrolyzed corn gluten, sugar, dehydrated onion, disodium inosinate and disodium guanylate, dipotassium and disodium phosphate, dextrose, sodium caseinate, torula yeast and autolyzed yeast extract, soy flour, xanthan gum, mono and diglycerides, natural flavor (contains wheat), turmeric extract (added for color), parsley, spices, and dehydrated garlic. Rice: cultivated wild rice, carrots, onion, celery, red bell peppers, almonds. 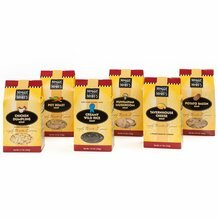 Hungarian Mushroom: Modified corn starch, maltodextrin, sunflower oil, dried mushrooms, salt, buttermilk solids, partially hydrogenated soybean and cottonseed oils, hydrolyzed soy, corn, and wheat gluten, beef fat, dehydrated onions, paprika, disodium phosphate, spices, natural and artificial flavors, caramel color, butter, yeast extract, dehydrated garlic, cultured sour cream (cream, cultures, lactic acid), disodium guanylate and disodium inosinate, nonfat milk, beef extract, whey, annatto extract, and sulfating agents. Pot Roast: Dehydrated vegetables (potatoes, carrots, onions, tomatoes, peas, leeks, mushrooms, green beans, parsley), modified corn starch, barley, maltodextrin, hydrolyzed corn, wheat and soy protein, salt, palm oil, sugar, natural flavors, autolyzed yeast extract, burgundy wine solids, caramel color, beef fat, beef extract, disodium inosinate, disodium guanylate, spice, and sulfating agents. Roasted Garlic Potato: Dehydrated potatoes, modified corn and wheat starch, palm oil, whey, corn syrup solids, salt, sunflower oil, maltodextrin, nonfat milk, parmesan and romano cheeses (low fat milk, cheese cultures, salt, enzymes), sugar, dehydrated garlic, sodium caseinate, xanthan gum, mono and diglycerides, dipotassium and sodium phosphates, citric acid, lactate acid, yeast extract, parsley, spice, soy lecithin, sodium stearoyl lactylate, polysorbate 60, natural and artificial flavor, paprika, dehydrated onion, annatto and turmeric (added color), and sulfating agents. Tavernhouse Cheese: Modified corn starch, cheddar, blue, romano and parmesan cheese (pasteurized milk, salt, annatto extract, cheese cultures, and enzymes), palm oil, corn syrup solids, dehydrated vegetables (carrots, onions, tomatoes, leeks, garlic, parsley), salt, nonfat milk, whey, soybean oil, maltodextrin, potassium chloride, disodium and dipotassium phosphate, citric and lactic acid, autolyzed yeast extract, natural flavor, butter, sodium caseinate, soy sauce solids (contains wheat and soybeans), xanthan gum, mono and diglycerides, silicon dioxide (prevents caking), soy lecithin, turmeric (color), spice, and disodium inosinate and disodium guanylate. These soups were excellent. I had the chicken and dumpling and the Hungarian mushroom. They were easy to make, superb flavors. The only drawback for me is their price. They might be worth the price,but they are a little pricey for me. You won't find soups that taste this well anywhere else unless you make them yourself. I would give them 5 stars for flavor (minimal amounts of flavor enhancers and shelf extenders). But 3 1/2 for price, so overall 4. Questionable- These products have too many chemicals in them, it is incredible! Go to a box store and buy the same thing for a LOT less.